FINAL WEEKS! Don't miss it! The show is sold out! But Heart of the Art NYC can get you in. Contact us today! Frida Kahlo: Appearances Can Be Deceiving has been the blockbuster New York City exhibition of the spring 2019 season. Shown in the United States for the first time are dozens of Frida Kahlo's exquisite clothes, personal mementos and photographs, as well as 10 of the Mexican artist's iconic world-famous paintings. Tickets are sold out for almost all weekdays and all weekends -- except here! Now, book your private tour today! ​And....by way of background: Frida Kahlo, wife of famed Mexican muralist Diego Rivera, endured polio at age 6 that badly weakened her right leg. At 18, she was gravely injured in a near-fatal bus-tram accident. 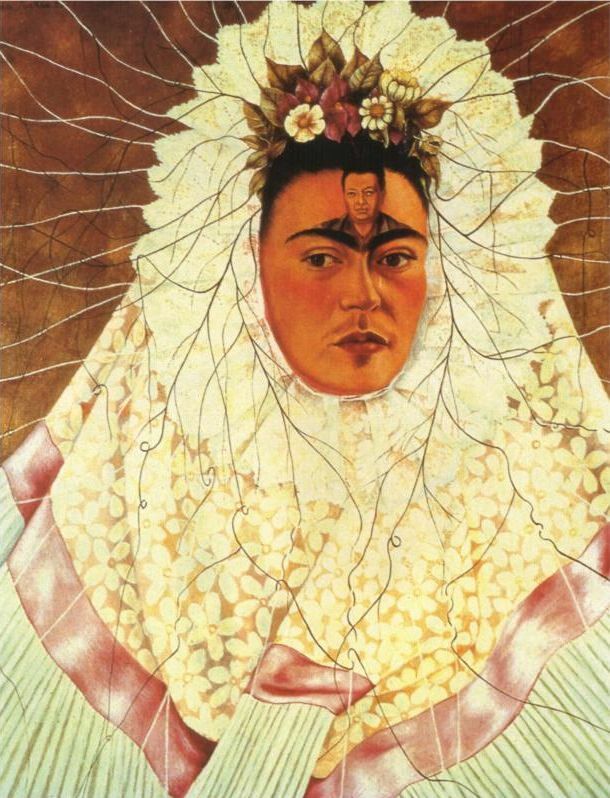 Kahlo's interest in painting was borne of this tragedy. And Kahlo gradually fashioned a dual persona. On the one hand, concealing her physical ailments and disabilities, she presented herself to the world in exquisite photographs wearing native Tehuana, Mexican garments; some of the world's top photographers captured her gaze and her dress. Meanwhile, in her 148 paintings, one-third of which are self-portraits, she exposed searing emotional and physical pains. Frida Kahlo: Appearances Can Be Deceiving is the largest U.S. exhibition in ten years devoted to the iconic painter, and it is the first in the United States to display Kahlo's collection of her clothing and other personal possessions, which were rediscovered and inventoried in 2004 after being locked away since her death at age 47, in 1954. These are displayed alongside important paintings, drawings, and photographs from the celebrated Jacques and Natasha Gelman Collection of 20th Century Mexican Art, as well as related historical film and ephemera. Emily is also proud to be providing free tours at the Brooklyn Botanic Garden on select Sundays that showcase plants seen in Kahlo's artwork and garden. Frida Kahlo in New York, 1946. Photo by Nickolas Muray. Diego on My Mind, 1943.